Thank you for taking the time to share your Healthy Workplace Initiatives/ Programme. The Healthy Caribbean Coalition (HCC) is in the process of developing an online portal to document and share established and emerging good practices in the fostering of Healthy Workplaces across the Caribbean. The portal will feature Caribbean private sector companies who have taken steps towards creating Healthy Workplaces which seek to respond to the regional epidemic of non-communicable diseases (NCDs). It will provide a platform for showcasing private sector action in NCD inward facing initiatives (healthy workplaces/ workplace wellness programmes) and outward facing initiatives(supporting NCD prevention and control through core business products and services). This work builds on the HCC/PAHO/COMSEC situational analysis of the private sector response to NCDs in the Caribbean conducted in 2015. The four main types of noncommunicable diseases are cardiovascular diseases (like heart attacks and stroke), cancer, chronic respiratory diseases (such as chronic obstructed pulmonary disease and asthma) and diabetes. Non-communicable diseases (NCDs) account for 7 out of every 10 deaths in the Caribbean; 40% of which occur prematurely within the most productive years. Investing in healthy workplaces has the potential to significantly impact upon the prevalence of NCDs amongst workers between the ages of 30 and 70 years. A healthy workforce translates to increased overall productivity and profits by reducing absenteeism, presenteeism, and worker turnover. Your workplace has been identified as a leader in this area, hence we are reaching out to you to share your experiences. In order to capture information about your healthy workplace initiatives or programme, we would like you to complete a brief online survey and participate in an onsite visit. By completing this survey you have agreed to feature your healthy workplace initiatives/ programme on the HCC HW online portal. 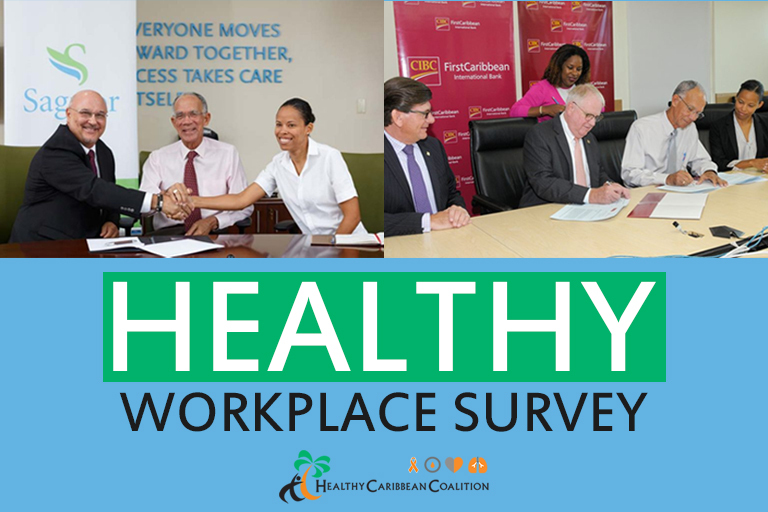 Please share with us any documents/ photos/ videos/ media releases related to your workplace wellness programme by emailing them separately to hcc@healthycaribbean.org. 1. Centers for Disease Control and Prevention (CDC). Workplace Health Promotion. 2. Mercer. (2016) The HERO Health and Well-being Best Practices Scorecard in Collaboration with Mercer. 3. Quantum Workplace. Workplace Well-being. 4. World Economic Forum. (2013) Workplace Wellness Alliance – Making the Investment: Employee Health and the Power of Metrics.